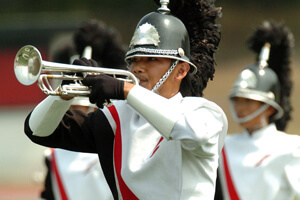 Taiwanese drum and bugle corps, Taipei Yuehfu, will travel this July to perform as part of the 2013 Drum Corps International Tour. The corps' summer trip to the United States, however, won't be its first. 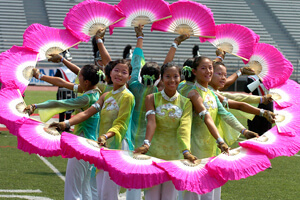 Taipei Yuehfu members have competed as part of the DCI World Championships four other times in 2000, 2001, 2002, and most recently in 2005. Taipei Yuehfu was founded in Taipei City, Taiwan in 1996 by a group of recently graduated high school students. Taught by an American instructor who had experience with the Blue Devils, the drum corps originally started as a 40-member marching band. A year later corps members donated the funds to purchase a set of G-keyed bugles, and the group transformed into a more formal drum and bugle corps ensemble. "From the beginning, we always set a goal to promote and introduce the value of marching music and the drum corps arts [to our corps members], and we have organized all kinds of activities to support this vision," Taipei Yuehfu Program Coordinator Paradox Chen said. "Invitations [to perform with various] international music societies in the past years have led to some very special experiences. Among the most valuable have been our tours with DCI." In addition to trips to the United States, Taipei Yuehfu has performed throughout mainland China, in Japan and Australia. Taipei Yuehfu performs at the 2005 DCI Open Class World Championship. The group plans to tour the U.S. with approximately 60 members, nearly half of whom will be accounted for in the brass section. The other half of the corps' membership will include percussionists (front ensemble and drum line), color guard members and drum majors.